Enjoy a nostalgic night of dancing to your favorite million dollar hits amid panoramic views of Haleakala, Up-Country, and bi-coastal Central Maui to South Maui vistas. 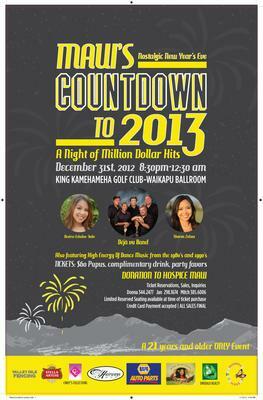 Relive your magical memories through the music of the Deja vu Band and special guest vocalists Sharon Zalsos and Desiree Echalas-Toda performing live at the King Kamehameha Golf Club Waikapu Ballroom, high on the slopes of the West Maui Mountains. You'll also shake and shout to high energy 80's and 90's DJ dance sounds hosted by 99.9 KISS FM radio personality Chris D.
This sock rockin' New Year's Eve event will include free heavy pupus (appetizers), party favors, and a complimentary drink. Donations will be made to Hospice Maui. Join in and write your own page! It's easy to do. How? Simply click here to return to Your Maui News Stories and Comments.